Named for Alvinia Schnoor, daughter of H.C. Schnoor, owner of small shipyard, Fairhaven, MI. Waterlogged & stranded being towed to Alpena, MI. 1874, Apr 1 Owned August Kirschner, Fair Haven, MI. 1874, Jul 6 Owned August Kirschner & Frank Dubay, Fair Haven. 1876, Apr 25 Rebuilt; 86.8 x 18.8 x 5; 52.81 gross tons. 1882, Mar 21 50.65 net tons. 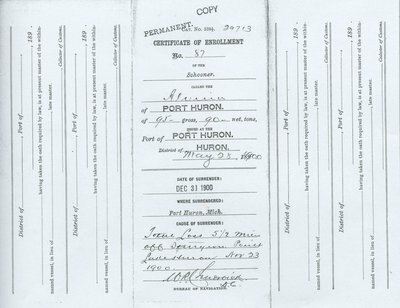 1888, May 14 Owned George E. Farrand, East Tawas, MI. 1890, Nov 29 Rebuilt; 89.4 x 20 x 6.7; 95.08 gross / 90.33 net tons. 1899, Sep 9 Owned F. C. Roberts et al, Huron Beach, MI. 1900, Nov 23 Wrecked 5 1/2 miles off Sturgeon Point, MI, Lake Huron. 1900, Dec 31 Documents surrendered.